In the past, getting a nice and even smile meant getting braces, which used brackets, wires, and tension to help shift teeth into a properly aligned position. These brackets and wires were quite noticeable, even if a person received ceramic (tooth-colored) braces. Healthy Smiles Dental is proud to offer the Invisalign® system. Patients throughout the Bridgewater, Massachusetts area have benefited from Invisalign®, which is just as effective as traditional braces but virtually invisible. The Invisalign® process begins with an assessment of the current position of your teeth. Using computer models, Dr. Michael Tabbah will then devise a proper treatment plan for your needs. Each Invisalign® treatment is customized to the patient to ensure optimal improvements of the smile. Patients will wear their custom-made Invisalign® aligners at all times except for when they are eating, drinking, or cleaning their teeth. Every two weeks, the patient will receive a new Invisalign® aligner which will gradually shift the position of the teeth until the treatment is complete. It’s as simple as that. One of the biggest benefits of Invisalign® is that the treatment is barely noticeable. These clear plastic aligners are thin yet durable, which means that you can go about your regular, everyday activities without anyone realizing that you are undergoing an orthodontic treatment. Another major benefit of Invisalign® is that your lifestyle is not severely impacted by the treatment as it might be with braces. You are still allowed to eat your favorite foods without hassle, and cleaning your teeth and your Invisalign® aligners is quite easy. 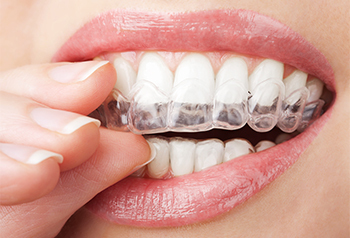 The best candidates for Invisalign® are people who have crooked teeth that they would like to have straightened out. Invisalign® is great for adults who don’t want their lives interrupted by invasive orthodontic treatment and for teens who would like to have the benefits of braces without the hassles. Invisalign® will not be able to address overbites, underbites, or extremely misaligned teeth. In such cases, other orthodontic treatments will be necessary. The best way to find out if Invisalign® or Invisalign Teen® is right for you is to visit Healthy Smiles Dental here in Bridgewater.